Chaingo Twitter account, Sorenson is on the left, Garrido is the to the right. Co-founders Andres Garrido and Jordan Sorensen are using Ethereum to help the unwieldy ocean freight industry to become more efficient, transparent and secure through the blockchain's decentralized system. The use of blockchain tech would be the biggest innovation in ocean freight since containerization, according to Rahul Kapoor, a Bloomberg Intelligence analyst based in Singapore. Key players in sea freight, such as AP Moeller-Maersk with ownership of almost 18% of the global liner fleet, are investing in blockchain and its multiple applications to optimize procedures and reduce operational costs. The transport and logistics sectors were valued at €2.7 trillion globally in 2016. Marine transportation accounted for €312 billion while logistics services brought in €658 billion, with maritime logistics accounting for €63 billion. 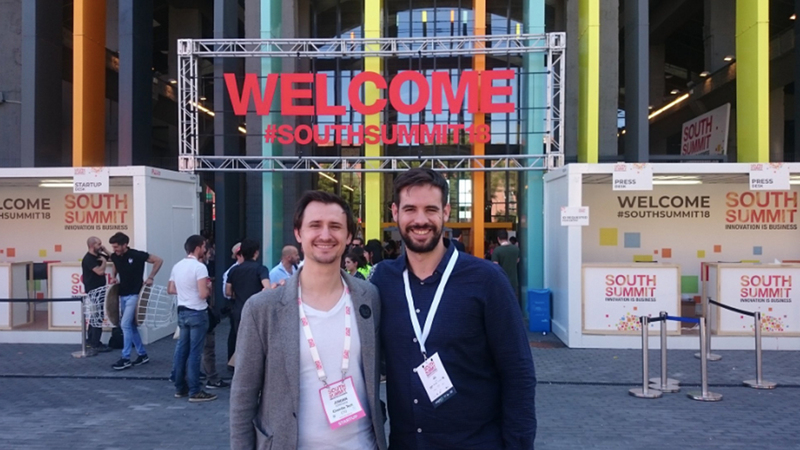 Two postgrads, Andres Garrido and Jordan Sorensen, developed the Ethereum logistics idea during an International MBA project at IE Business School in 2016. Their ChainGo startup is one of the pioneers of this revolution. ChainGo's paperless system works through smart contracts and enables B2B clients to automate the entire process including the agreement of compliance policies and contracts with multiple parties for each shipment. The logistics involved in the maritime sector can be extremely complex due to the number of parties involved and the amount of paperwork needed to fulfill an order. The blockchain's sophisticated cryptography allows all users in the supply chain to participate in highly secure transactions within an evenly distributed and interdependent network. This decentralized and transparent system will significantly reduce the level of dependency on intermediaries and minimize operational costs. ChainGo is now focusing on collaboration with the other parties in the supply chain such as port authorities. The team is currently working with the Port of Valencia and the Port of Algeciras to test various blockchain applications. While the pilot phase is still in progress, ChainGo is already planning for the commercial launch of its first SaaS license product in 2019. “At the moment, we have two pilot projects that are very close to being turned into customers, and eventually we will have a few more. Our idea is to close the year with a total of five piloting schemes,” says Garrido. The pilots will help to bring in more new players to try ChainGo's concept, as well as produce the KPI evidence that the blockchain system can achieve the desired results, and by then, new players can be involved, according to CTO Sorensen. “This helps us in all aspects of logistics and international trade as our primary focus is to simplify the documentation process and flow of information through blockchain, as well as the application of Big Data and its resources,” he explains. Sorensen had moved to the US for further studies in Big Data and Business Analytics straight after completing his MBA. During the validation stage of their academic project in 2016, both Garrido and Sorensen were talking to industry experts and logistics CEOs who showed significant interest in their blockchain system. “We started with a first funding round backed by companies, not business angels,” says Sorensen. A mix of international and local investors took part in the first round: Carex Logistics and its related family fund Los Riscos de Penique, Marin Holding, a German-Cypriot company with a dedicated maritime logistics department and Grupo Cosimet which primarily exports metallic components across Europe. ChainGo is now looking for a second injection of capital that will include investors from the first round and venture capitalists. The main objective is to get financial investors on board to expand and to set financial targets. “Financial investors push you in one direction because they want returns and they want them fast,” says Garrido. ChainGo is currently establishing its position in Spain where the ports are expected to handle over 560 million tons of goods by 2019. But the founders are also thinking globally. “In the shipping industry everything is international, you cannot build a solution that is only for the Spanish market, you need to have clients all over the world because your clients are going to work with people from all over the world," Garrido says. South America is an easy target for them, as well as the Netherlands and Southeast Asia, where blockchain communities are quite innovative. The significant volumes of cargo managed in those markets will also help ChainGo to grow as a key provider of blockchain services for all aspects of logistics and international trade. One of the biggest hurdles in the cargo industry is the optimization and automation of procedures and paperwork flows. ChainGo's Ethereum platform will digitize the documentation process and guarantee the verification of transactions, traceability of paperwork and the authenticity of document signatures. Nonetheless, Asian markets are already experimenting with tokenized transactions in Ethereum, using TEU cryptocurrency as deposits for bookings within container shipping. Disrupting the highly conservative models of the cargo industry with one of the most innovative and complex technologies like blockchain can be challenging, especially when it comes to regulations. Multiple governmental directives affect the shipping industry. Each shipment could be passing through multiple borders, authorities, and institutions, and therefore numerous procedures and parameters will be involved. In 2014, Maersk monitored the shipment processes of a container departing from Kenya to the Netherlands. The overall operation took 34 days. Within that period, approximately 10 days were spent on processing documents with the involvement of over 30 people in the operation. Industry players are putting the squeeze on the authorities to move towards digitalization because key operators are already testing blockchain applications across various logistics sectors.